Click on the image below for a printable copy of the Iowa Periodicity Schedule. Please contact us if you have questions or need help with this document. Prenatal visits: Recommended for first time parents, high risk, or if requested. The prenatal visit includes anticipatory guidance, review of family history, and discussion of the benefits of breastfeeding and plans for feeding. These visits are not reimbursable. Birth exam: Every infant. Encourage breastfeeding and provide information. 2-5 day visit: Every infant should have an evaluation between 2-5 days of age and within 48-72 hours of discharge to include assessment for feeding and jaundice. Healthy infants discharged before 48 hours of age should be seen within 48 hours of discharge. Thirty-month visit: A 30-month visit is strongly recommended for developmental screening. This is a good age to promote family routines, review and promote language and social development, review any concerns about behavior and/or preschool, and promote safety. Medicaid will reimburse for this visit. Older children and adolescents: Annual screening exams are recommended by the American Academy of Pediatrics (AAP) and by Iowa Medicaid. Comprehensive histories should be taken at initial and interval well visits. Use the WHO growth charts to monitor growth for infants and children ages 0 to 2 years of age in the U.S.
Use the CDC growth charts to monitor growth for children age 2 years and older in the U.S. Blood Pressure: Blood pressure should be checked annually beginning at 3 years of age. Infants and children with risk factors should have blood pressure checked before 3 years. Access NHLBI/NIH blood pressure charts. Developmental surveillance is required for every health maintenance visit and is not separately reimbursable. Developmental surveillance consists of reviewing family and child strengths and risk factors, eliciting caregiver concerns, reviewing developmental milestones, observation of the child, monitoring and anticipatory guidance. Any child who is identified as having a developmental concern should undergo developmental screening using a standardized screening tool. If potential developmental concern is noted, child should be referred immediately for more in-depth diagnostic evaluation. Developmental Screening: Screen at 9, 18 months and 24-30 months. ASQ-3 is the suggested tool. Medicaid will reimburse for a standardized screening tool (billing code 96110). Autism Screening: Screen at 18 and 24 months. M-CHAT R/F is the suggested screening tool. Medicaid will reimburse for a standardized screening tool (billing code 96110). Any child suspected of autism spectrum disorder should be referred immediately for services, diagnostic evaluation, and receive an audiological evaluation. Family Risk Factor Screening: Assess family risk factors using the Bright Futures Pediatric Intake Form. Caregiver Depression Screening: Medicaid will reimburse for using the Edinburgh Postnatal Depression Scale or the Patient Health Questionnaire 9 (PHQ-9). The PHQ-2 is not a separately reimbursable service. Depression Screening: AAP/Bright Futures recommends screening of children and adolescents for depression beginning at 12 years of age. The Patient Health Questionnaire-2 (PHQ-2) is a brief and practical tool to use. If screening is positive on the PHQ-2, the PHQ-9 should be administered. Medicaid will reimburse for the PHQ-9 or other standardized tool. The PHQ-2 is not a separately reimbursable service. The CMS Center for Medicaid and CHIP provides information about prevention and early identification of mental health and substance use conditions. Learn more. Tobacco, Alcohol and Drug Use Screening: AAP/Bright Futures recommends screening for alcohol, tobacco, and substance use annually beginning at 11 years of age by asking directly about usage or experimentation. The CRAFFT screening tool is helpful for identifying problem use and is a suggested tool. Medicaid will reimburse for the use of the CRAFFT or other standardized tool. More information and resources are available on the Developmental Care and Mental Health Care pages of this website. Assess risk at every visit. Vision screening should start at 4 years of age and in cooperative 3 year olds. Consider instrument screening at 12 and 24 months and at 3, 4, and 5 years of age. Iowa law requires that the parent or guardian of a child enrolled in kindergarten or third grade ensure that evidence of a child vision screening be submitted to the school in which the child is enrolled. This may be submitted in electronic form or hard copy, or electronically through Iowa Immunization Registry Information System (IRIS). Vision screening can be performed in several settings, including healthcare provider’s office. The vision screening can be done up to one year prior to the child’s enrollment in kindergarten or third grade, or no later than 6 months after enrollment. More information is available from the Iowa Child Vision Screening Program. Iowa law requires universal hearing screening of all newborns and infants in Iowa. Confirm initial screen was completed, verify results and follow up as appropriate. Follow guidelines for best practices from Iowa's Early Hearing Detection and Intervention Program (EHDI). Iowa EPSDT recommends in-office screening using audiometry, beginning at 4 years. Screen at least once between the ages of 11 and 14 years, once between 15 and 17 years, and once between 18 and 21 years, using audiometry to include frequencies between 6000-8000 HZ. Newborn Screening: Note that newborn screening includes blood spot, bilirubin, hearing screening, and screening for critical congenital heart disease by pulse oximetry after 24 hours of age and before discharge. Confirm initial screen was accomplished, verify results, and follow up, as appropriate. Hemoglobin/Anemia: Test at 12 months. Assess risk at 4 months, 15 months, and at every visit afterwards. Menstruating females are at risk for iron deficiency anemia. Lipid Screening: Test all children once between 9 and 11 years and once between 17 and 21 years. For universal screening, non-fasting non-HDL cholesterol can be used. Assess for high risk at 24 months, and at 4, 6, 8, and 12-17 years of age. Children at big risk should be screened with a fasting lipid profile. For age-appropriate immunizations, follow CDC immunization guidelines. Every visit should be an opportunity to update and complete a child's immunizations. For all children: test at 12 and 24 months. For children at higher risk: test at time high risk is determined and at 12, 18 and 24 months, then annually up to age of 6 years. Blood lead tests: a blood lead test result equal to or greater than 15 ug/dl obtained by capillary specimen (finger stick) must be confirmed using a venous blood sample. Since 2012, the Centers for Disease Control and Prevention has considered a blood lead level of 5 mcg/ml elevated. If you have questions, please contact the IDPH Childhood Lead Poisoning Prevention Program. Cervical Dysplasia Screening: Adolescents are no longer routinely screened for cervical dysplasia until 21 years of age. The 2010 AAP statement “Gynecologic Examination for Adolescents” notes the indications for pelvic examinations prior to age 21 years. Annual testing is recommended for high risk groups, which include household members of persons with TB or others at risk for close contact with the disease; recent immigrants or refugees from countries where TB is com­mon (e.g., Asia, Africa, Latin America, Pacific islands and former Soviet Union); migrant workers; residents of correctional institutions or homeless shelters; persons with certain underlying medical disorders. Children with HIV and incarcerated adolescents should be tested yearly. Visit the IDPH website for more information on TB Testing. An examination of the oral cavity and dentition, and teaching about oral/dental health care should occur at every visit. Refer to dental home by 12 months or within 6 months of eruption of first tooth. Ask about dental home at every visit. Iowa law requires that children under the age of 12 years who receive Medicaid must have a dental home. The I-Smile Dental Home Initiative was created to assist with locating, training and matching children, particularly young children, with dental providers in Iowa. They use dental hygienist care coordinators to assist physicians and families find dental homes. 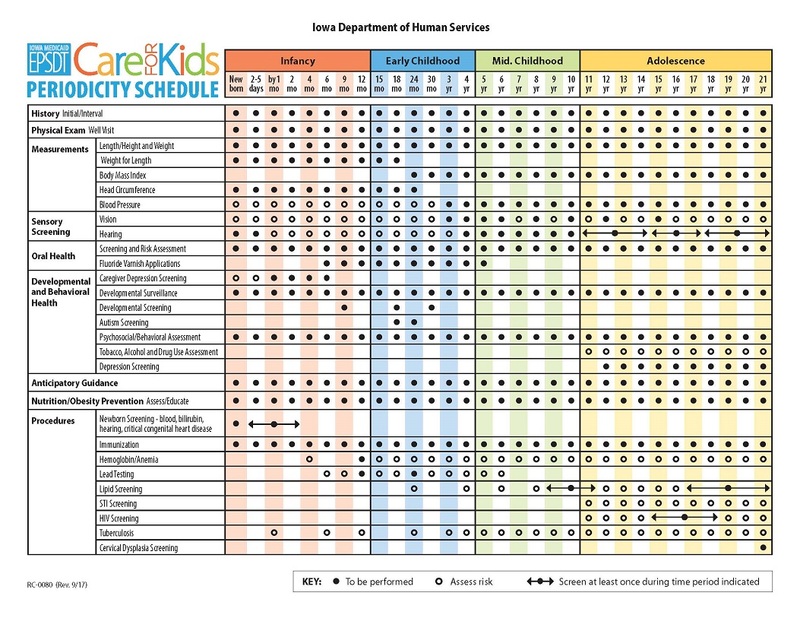 Iowa’s Periodicity Schedule of Dental Services for Medicaid-enrolled children identifies the types of services recommended based upon the age of a child and risk for dental disease. The recommendations were developed using information from the American Academy of Pediatric Dentistry and also Iowa’s definition of a dental home. Download a pdf of the Medicaid Dental Periodicity Schedule for Children. AAP recommends fluoride varnish. See AAP Dentistry Policies and Guidelines on the use of fluoride and prevention of early childhood caries. Once teeth are present, fluoride varnish may be applied to all children every 3-6 months in the primary care or dental office. Indications for fluoride use are noted in Fluoride Use in Caries Prevention in the Primary Care Setting. Iowa Medicaid reimburses physicians and nurse practitioners for application of fluoride varnish in conjunction with an EPSDT screening. This I-Smile flyer includes information about available training for providers and clinic staff, as well as guidelines, and billing and reimbursement information. Find water system information for Iowa counties on the CDC My Water's Fluoride website. EPSDT encourages providers to offer practical and contemporary health information to parents before significant physical, emotional and psychological milestones. This guidance will help parents anticipate impending changes and take action to maximize their child’s developmental potential and identify their child’s special needs. Bright Futures: A joint project of the Maternal and Child Health Bureau and the Academy of Pediatrics, these offer comprehensive health supervision guidelines and tools, including recommendations on immunizations, routine health screenings and anticipatory guidance. Bright Futures also offers free parent handouts and other resources. Zero to Three: Materials for parents and providers, including child development handouts for parents that discuss development from the child’s perspective. Ages and Stages: A series of downloadable brochures on child development based on age from Iowa State University. These brochures are also available in a Spanish version, Edades. Essentials for Parenting Toddlers and Preschoolers: This CDC website provides information and materials to help parents develop strong, stable and nurturing relationships with their children. The Academy of Pediatrics recommends that transitioning to adult healthcare begin at 12 years of age. Find more about the transition from adolescent to adult health care from the AAP's Transition Resources. The Got Transition website is an excellent resource for professionals, teens and families. It covers all aspects of transition planning.